Today is Lundi Gras. 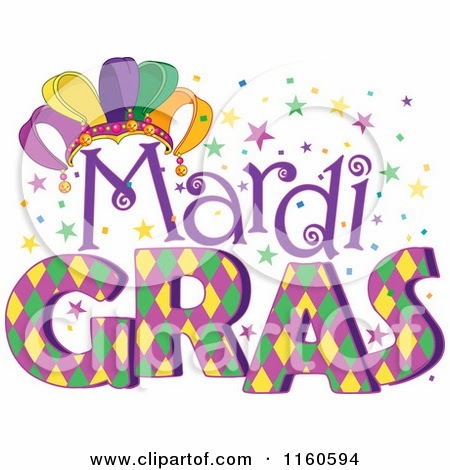 Those who know a little French, recognize that as being "Fat Monday," after all, "Mardi Gras" is French for "Fat Tuesday." It is the sixth Mardi Gras since I moved to Louisiana, and I thought I would share some reflections. First of all, in South Louisiana, Mardi Gras is not just one day. It is a SEASON. The season begins on January 6, the Roman Catholic Church's Feast of the Epiphany, also known as Three Kings Day. For purists here, that is traditionally the first day on which you can eat King Cake. For the record, I love King Cake. It seems like each bakery takes great pride in the quality of its King Cake, and everyone seems to have some special touch. The very simple description is that it is a twisted, filled sweet roll/bread, usually with at least a cinnamon filling, if not some other flavor, which is in the shape of an oval, and is frosted and sprinkled generously with colored sugar. (More on colors in a moment.) Today, many come filled with cream cheese, fruit (strawberry), or even candy mixtures (praline). They can be so sweet as to make your teeth ache. From early January on, South Louisiana is decked out in these three colors. Then there are the parades. Ah, yes, the parades. While New Orleans is most famous for them, there are parades throughout the region. Some have floats which are very family friendly, some have floats which are bawdy, and some floats are downright raunchy. In New Orleans, none of the motorized parades go through the Quarter any more, and there is a complicated scheduling algorithm and set of routes for most of the parades. Like for so many holidays, people here seem to fall into one of two camps: Love it (want more of it) and Hate it. Once in a while you find folks who are neutral, but not so often. Those who live here and love it, point to the family events and activities. Parades are often an opportunity for families to gather. Many of the parades (day and night) are visually stimulating. They can even be very educational in talking about the classic, mythical creatures who are either portrayed or used as the theme for the Krewes which put the parades on. Parades outside of New Orleans are often daylight parades, and are really family events. Unlike (well, my experience of them) "Northern" parades, parades here are all about the "throws." "Throw me something, mister!" is a cry heard all along the parade route. Most parades have beads (classic, you can buy them in the French Quarter year around), some simple and in the basic Mardi Gras colors, and others with added decorations, often reflecting the theme of the Krewe or float. For example, the parade Muses (in New Orleans) usually includes throws with ladies high-heeled shoes. One year we caught a bracelet from that parade which was just plastic shoes. There are many, many traditions, and many people love Mardi Gras and all its traditions. For those who hate it, there seem to be as many reasons as there are people. Let's go backwards from the "love it" list above. Many "natives" resent those "from away" who have come in and adopted the Mardi Gras celebrations, often without any understanding, or appreciation of the traditions. This year, I observed a set of heated conversations about who should be allowed to carry a "flambeaux" (the lighted torches used to illuminate the night parades). I am not sure that I understand all the subtleties of the debate, but the carriers are traditionally masked, and, at one time, were limited to male slaves (and this was the only way that they could see the parades). I live near where the Baton Rouge parades travel. I can tell you, for all those beads, there is a huge amount of trash generated, and left on the ground for "someone" to pick up. Last Saturday, as I was heading out, some of the floats were headed in along a street over a mile from the assembly point. I saw floats departing as I returned home. One of the things I noted was the huge number of clear plastic bags blowing around, along the street which was over a mile away from any parade activity. It was even worse when, late that afternoon, when I drove down one of the streets of the parade route! What a mess of plastic bags, beads, plastic cups, and assorted trash. Finally, while many of the parades are suitable for families, there are many parades, or even floats within other parades, which are bawdy at best and borderline obscene at worst. I have seen some things which I would not want to have to explain to a young child! Where do I fall? In between. I can appreciate the visual appeal. Night parades can be dramatic. I appreciate the camaraderie which develops for a krewe, including the year around work, fund raising and social events. It is definitely fun for kids -- at appropriate parades, and many are just fine. It is an important part of the culture of South Louisiana, and this would be a very different place without it. Oh, and I love King Cake! What I am not so fond of is the madding crowd and often bad behavior which accompanies the parades. Much of this is the result of those "from away" who come here to party, forgetting that there are those of us who live here. There is a fair amount of disruption of the routines of daily living. These range from having to recalculate travel times and routes, to the unannounced road closures. It is a season. It has a beginning, and, thank goodness, an end.